Rimage Catalyst incorporates proven, durable components, air filtration innovations, new usability features, a small-footprint frame, and choice of printer. Catalyst is a best-in-class system that is unlike anything else in the market. 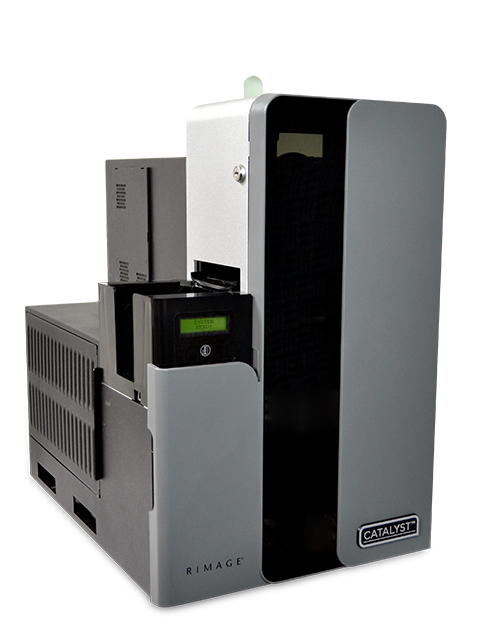 The latest in the Rimage line of disc publishing systems, and is ideal for customers with medium-volume requirements. Catalyst is the perfect hybrid of the rugged durability of Producer, with the features of a Professional system. Engineered with filtered positive airflow, the Rimage Catalyst series is ideal for reliable operations even in challenging environmental conditions. Rimage combined the most popular features from its Professional and Producer series publishers, bringing them together in this rugged, yet flexible and front-office friendly digital disc publishing solution. The Catalyst 6000 offers the industrial grade robotics and the world’s best full-color or thermal monochrome disc printers. Load up to 150 discs and you’re ready to publish professional-looking, high-quality discs on demand using the world’s best full-color and thermal monochrome disc printers. With reliability as the foundation, Catalyst systems blend designer looks with ease of operation in a smaller footprint ideal for your front office. The Rimage Catalyst series introduces filtered positive airflow into the Rimage product line, offering reliability in environments where dust or debris in the air would normally cripple sensitive robotic systems. Air for cooling is pulled into the system through a commonly available filter, driven by the system’s fan.